What's the one thing I'd change about my face? Everyday I wish I'd wake up one morning with the lashes of my dreams - thick, dark,doll-like. But I wake up with pronounced puffy, honey-colored eyes that look jaundice-like without an umbrella of prominent lashes. That 13 Going On 30 (movie) wishing dust - I WANT! Describe my eyelashes in 20 words or less? They're so thin & nondescript, it's like the split ends from my hair fell down on my lash line. How many mascaras am I currently using/trying? 6. I feel I can now stop looking for THE ONE. I feel I can now stick to 1. But I don't know which one. Mascaras I keep going back to? 1. Maybelline Volum Express the Colossal Mascara ~ It adds length and thickness, but still separates the lashes. 2. Maybelline The Falsies Mascara ~ The first time I tried it, I didn't like it so much. But after a few weeks to a month, when the formula becomes drier and thicker, I was hooked! 3. Max Factor 2000 Calorie Curved Brush Mascara~ See a post on it here. I'd buy it again, but it's not available here. How much time do I spend applying my mascara everyday? 3/4th of my total makeup application time. Apply, wiggle....wiggle...wiggle....comb through clumps. Repeat. 4 time. Of course! I stand in the bathroom and make the Scream (movie) mask face . Bathroom - because there are no fans & air conditioners in there. Air dries up the mascara too fast & ruins the layering process. Scream mask face - to keep the tops of my cheek bones away from the wet wand. What's the craziest thing I'd do for thicker, longer lashes? I'd steal them from my own son, who has my dream long, wispy lashes. Itsy bitsy spider climbed up the water....SWAP! I love him so, sooo....much! Have I considered that surgery where they stitch individual hairs to the eyeli....? Have I considered eyelash extensions? Now that I've been thinking about for quite some time. I'm finally doing it this year. Soon! I can't use mascaras anymore after that, not on extensions. Here, I'm wearing Maybelline the Magnum Barbie Mascara (Price: Rs.399). As you can see, it does make a huge difference. It has fibres which extend the length and add volume. 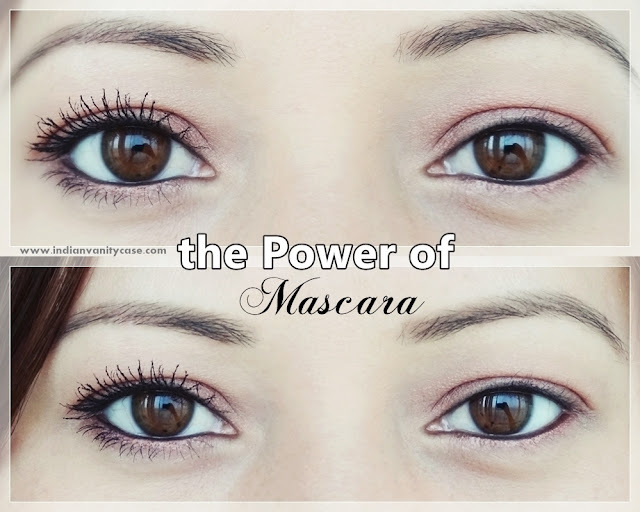 It usually takes me some time to like a mascara, but I loved this from the first time. It's also waterproof & smudgeproof, and lasts till I wash it off at night. It's all good, but the fibres can feel pokey sometimes, and if you brush your lashes after application bits of fibres will fall on your face. Now I just run a kohl on my upper waterline to remove or smooth out any stray fibres & I avoid brushing or combing when the mascara has dried. Keep in mind that sometimes I apply it better & much more patiently. Ha-ha I understand your mascara struggle. At least your lashes are not poker straight like mine are. Once my own lashes poke my eyes so badly that I have to remember to use lash curler once in every few days. CZ use some castor oil lightly on your lashes and wash it off after half an hour later.I tried this for stronger, longer and thicker lashes. Maybelline really do well when it comes to mascaras. I have one too and I so love it. Oh, you're like me. My makeup isn't complete until I'm wearing obnoxious layers of mascara. I do have fairly decent lashes, but unless they're big, wild and doll like, I'm just not satisfied! I love Maybelline's Colossal, but lately I've been trying out a new mascara from Bourjois called the Push Up Volume Glamour in ultra black. Try it. Amazing blackness, volume and lift! Castor Oil.. I have seen it working on my eye lashes. I get results within 1 week. It's nice but it's so waterproof that it doesn't come off easily and I hate that :/ Definitely not using it daily coz it's a pain to remove!